The final mystery mentioned in the New Testament is The Mystery of Babylon the Great (Rev17:5). This is probably the most complex of all our mysteries because it involves visions and dreams given to God’s people over hundreds of years. The concept of God is not a human construct. Rather, it is the truth about the Eternal Truth, which has been handed down through the generations of humankind from the beginning of time. In some communities, this truth has been corrupted and contaminated over time, but the Eternal Truth continues to reach out to humanity. Throughout history the Creator has been making Himself known to anyone who will turn to Him and some of these people were selected to record His Word. While much of humanity turned away from their Creator and followed false paths, the Father ensured His Word was freely available throughout the whole world, either by print or by word of mouth, or by His Spirit. Each and every person will have the opportunity to respond to their Creator – to either accept or reject His Truth. After Jesus sanctified God’s Word and paid the debt for humanity’s sin, God poured out His Spirit on millions of people who accepted His Way, enabling them to “go into all the world and preach the gospel” (Mark 16:15). It is this gospel – the Good News of God’s great gift of eternal life through the Lord Jesus Christ – that false religion seeks to debase and conceal. Our last mystery is about the evil that seeks to keep people from knowing the Father through His only Son. The apostle John was guided by the Holy Spirit to carefully record the Revelation of Jesus Christ, which God gave to Him to declare to His servants (Rev 1:1), thus giving us an insight into this evil. The Father wants His people to be prepared with understanding before the end-time events begin to unfold (Prov 22:3; 27:12); He wants us to understand His Truth and He tells us we will be blessed by reading, hearing and meditating upon His Revelation (Rev 1:3). Babylon the Great is also called the Great Whore (Rev 17:1; 19:2), but she is not simply a whore, she is the progenitor of whores. There are good biblical reasons to believe that most false religions, and the abominations that accompany many of them, began in Babylon. From her came a multitude of idolatrous practices, which I have no doubt were sown and grown by satan to keep people from knowing their Creator. The whore symbolises these false religions. From Revelation 17:7 we have discovered that the last mystery is about an immoral woman, who represents false religion and the beast that carries her. 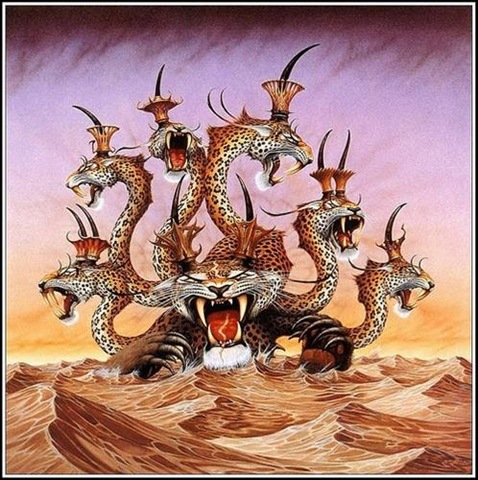 Although some people feel this leopard-like beast is a different beast to the scarlet beast of Revelation 17, there are so many similarities it seems reasonable to assume they are the same beast with a few minor aspects presented differently in each vision. The Father’s great plan is to establish the Kingdom of our Lord and of His Christ. However, before God’s kingdom is fully realised, satan will carry out the final phase of his evil agenda on earth, and it would appear that Babylon the Great is at the centre of the mystery that will unfold just before the Creator destroys all who have caused destruction on His earth. 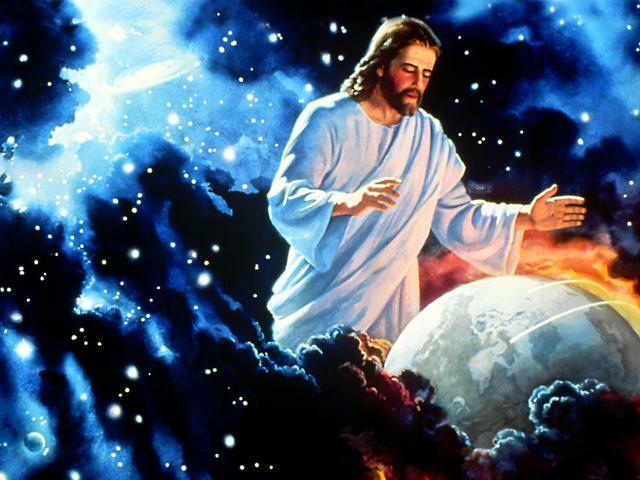 Only then will His New Heavens and New Earth come into existence, where there will be no more pain, suffering and death (Rev 21:1-4). We know the Father is the Revealer of mysteries (Dan 2:29). When writing to the Corinthian church Paul assured them that the Holy Spirit reveals things that God has prepared for those who love Him (1 Cor 2:9-10). Therefore, this age old mystery needs to be pondered, and with godly wisdom penetrated, and the best place to begin is the Bible. Some commentators have suggested these kings are Roman emperors, but others suggest they are kingdoms. Hills, or as the word can also be translated – mountains, are rather prominent features in a landscape. The same could be said of empires in the landscape of history. Most people would be hard pressed to remember which emperors predated John’s vision, but world empires are far more prominent and stand out in our view of history. We also have the precedent of a number of Old Testament prophets who used the word “mountain” when referring to kingdoms (see Is 13:4; Jer 51:24-25; Mich 6:1-2). These kingdoms, or empires, were the major world powers to the time of the Revelation, when Rome was in power. They were also all empires that at one time encompassed Israel, God’s Holy Land. When John had his vision Rome was in power, but as John stated, there was another king/kingdom that had “not yet come” (Rev 17:10), this is the seventh head of the beast. The “kingdom” scenario convincingly reveals a long history behind John’s vision. It also represents a trend. Babylon the Great of the Revelation represents humanity organised in rebellion against God. The combination of false religion and powerful, pagan world empires has been a continual reality in the world’s history. These pagan empires rose and fell, but the Creator, in His sovereign wisdom, allowed this march of history. As people continued to ignore His call to turn to Him, He wove His own redemptive plan through humanity’s wayward path. However, we have already determined that the seven hills represent seven kings which most likely represent seven kingdoms. Also, the woman is “drunk with the blood of the saints and with the blood of the martyrs of Jesus” (Rev 17:6). The Roman Catholic Church has indeed persecuted many followers of Jesus, who refused to come under her power, but there have been many others who have also persecuted God’s people throughout the centuries. The whore would appear to be far greater than the Roman Catholic Church. It would be more accurate to say the whore represents religious systems like the Roman Catholic Church. Interestingly, the title Pontifex Maximus is used by the pope. This title was once used by the emperors of Rome in their capacity as high priest of the ancient pagan Roman religion. 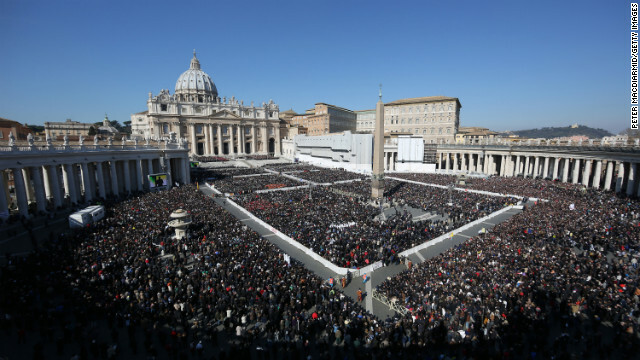 The pope has absolute rule over a so-called Christian denomination that is riddled with pagan corruption. Whether we call it Christianised paganism or pagan Christianity is a moot point, the fact is, it is not biblical Christianity, and therefore, it is a false religion. 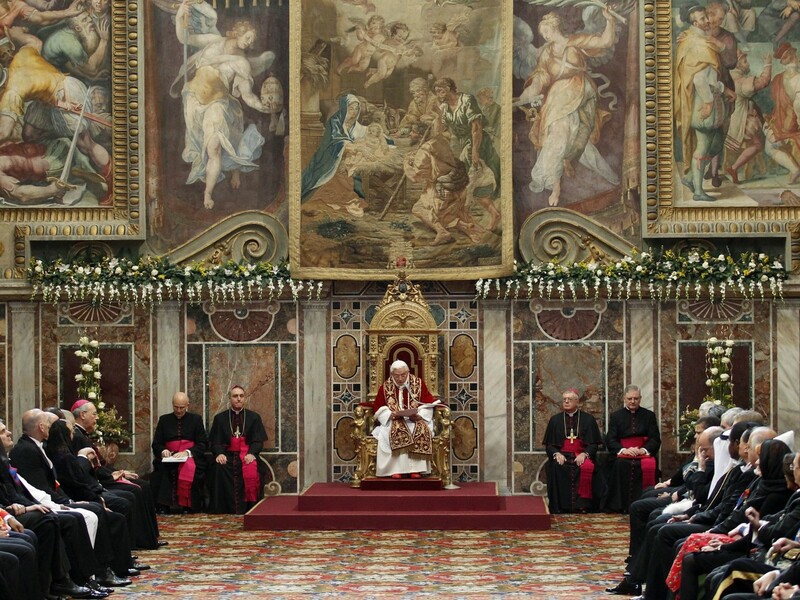 The pope’s role is to usurp God’s reign and rule by representing the Lord Jesus Christ. He claims to be a high priest, when the New Testament outlines no such office. As we learned in our second Great Mystery, individual believers are indwelt by the Holy Spirit and it is He who guides and instructs (John 16:13). There is no need for high priests under the New Covenant. The high priest’s role was to stand between God and His people, Jesus has removed the need for this role because He is now our eternal High Priest (Heb 2:17; 3:1; 4:14, 15), we need no other. The Roman Catholic Church certainly fits the picture being painted by the whore and the beast, but it is only one of the many organised systems of religion people have used throughout the ages to help support powerful kingdoms in defiance of their Creator. The Revelation is telling us that ultimately, humanity will unite in opposition to God, and it is this great, united, worldwide system of religion and government that Babylon the Great represents. But let us return to the beginning of our mystery and fill in a few more details. From the Revelation we learn that God will judge Babylon the Great for her iniquities (Rev 16:19; 17:1; 8:10) and eventually we discover that “Babylon the Great is Fallen” (Rev 18:2). To understand the deeper meaning of this judgment we need to go to the very beginning of God’s Word, to the first mention of Babylon. 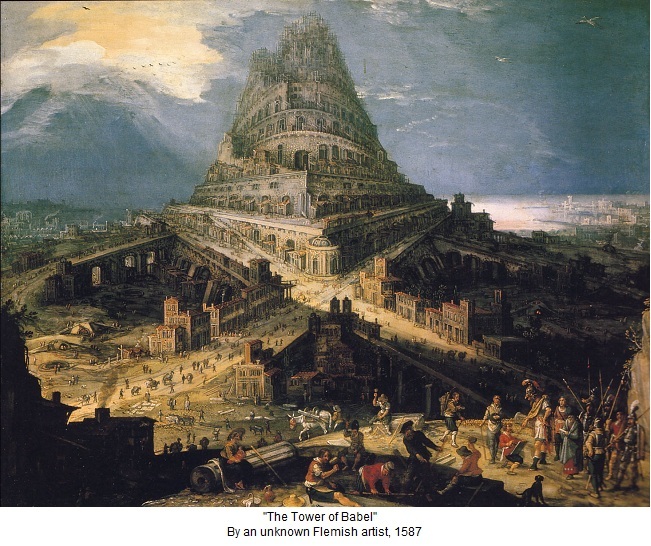 There we find that Babel (Gen 11:9), which in the Hebrew language is the same word as Babylon, was one of the first cities mentioned in the Bible. The Greek word for “city” in the New Testament suggests an area enclosed by a wall, whereas in the Old Testament it can be as simple as an encampment that is guarded by a watch. Common to both is the sense of a gathering place for a group of people who watch over one another, defending themselves against man and beast. Cities in the Bible tend to nurture either God centred or God rejecting practices, and Babylon has almost universally come to be seen as being synonymous with godlessness. From the Revelation we learn that not only is she godless, she actively promotes rebellion against God. This was not something that developed over many years; rebellion was present at the very beginning, when Babylon was first constructed. Judaic interpreters as early as Philo and Yochanan ben Zakai (1st century AD) interpreted “a mighty hunter before the Lord” (Heb. : לפני יהוה, lit. “in the face of the Lord”) as signifying “in opposition to the Lord”; a similar interpretation is found in Pseudo-Philo, as well as later in Symmachus. Some rabbinic commentators have also connected the name Nimrod with a Hebrew word meaning ‘rebel’. Nimrod, in a sense, was the original archetype of a godless, tyrannical ruler. He used physical force to achieve his ends as he attempted to usurp God’s rightful reign and rule over the earth. The rulers of our six kingdoms, or empires, followed in Nimrod’s footsteps. The emperors of Rome even went so far as to proclaim themselves gods. As noted earlier, Babel was the first of the cities ruled by Nimrod. Therefore, it is reasonable to assume that it was Nimrod who ordered the building of the Tower of Babel. He decided to create a strong city made from fired bricks, which featured a magnificent tower. Rather than trusting in their Creator to watch over them, Nimrod and his people decided to trust in their own strength and skills. The tower’s construction was meant to promote the power and prowess of Nimrod and his people for miles around (Gen 11:4). This rejection of God’s dominion did not go unnoticed and God consequently determined to divide the community and their efforts by creating a number of language groups (Gen 11:7), thereby effectively achieving His original directive. When they could no longer all understand one another, they divided and spread out “upon the face of all the earth” (Gen 11:8a). It seems reasonable to assume that God gave individual, new languages to individual families, or clans, within the original larger group. The Bible tells us that everyone spoke the same language until that time (Gen 11:1), but when people could no longer communicate with one another, tensions would arise and they would naturally separate into language groups. Consequently, a number of clans separated from the original group and spread out over the earth, creating new nations (Gen 11:8-9). 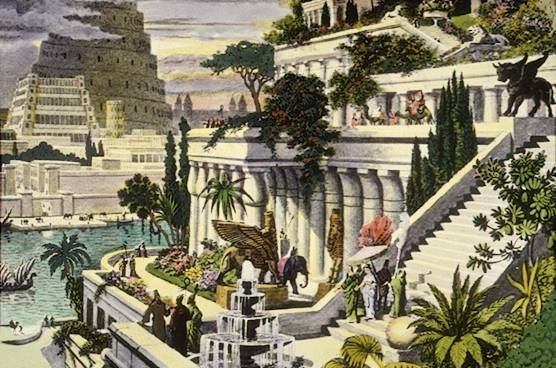 The next time Babylon is mentioned in the Bible, 1500 years have passed and we find that, although building was brought to a halt in Nimrod’s time (Gen 11:8b), in the ensuing years Babylon had grown into a mighty empire, occupying the lands between the Nile and the Euphrates Rivers (2 Kings 24:7). This now powerful empire of idolatry and pagan practices was then ruled over by a Chaldean king named Nebuchadnezzar. 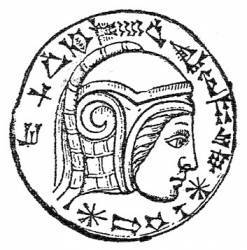 This name reveals the pagan roots of the nation Nebuchadnezzar ruled, as it means “Nabu has protected the accession right”. Nabu was a Babylonian god – the son of their supreme god of wisdom, Marduk. Isaiah says of the king of Babylon, that he “ruled the nations in fury, with relentless persecution” (Is 14:4-6). Many believe this is actually an allusion to the power behind the throne, satan himself. Even though Nebuchadnezzar was a gentile, who worshipped a pagan god, we find God was able to use him. He was God’s instrument of judgment on Judah for its idolatry, unfaithfulness and disobedience (Jer 25:9). Satan had an agenda, but God’s sovereignty is demonstrated as He worked through this heathen king. After defeating Assyria in 605 BC, Nebuchadnezzar assumed the rule of the Babylonian empire and reigned from 605BC to 562BC. During his reign he conquered Palestine, destroying Jerusalem and Judah in 586BC. When he destroyed the Temple in Jerusalem he took its wealth to the treasure house of his god Marduk in Babylon (Dan 1:2). The prophet Jeremiah called Nebuchadnezzar the servant of the Lord (Jer 25:9; 27:6). God used Nebuchadnezzar to carry out His judgment on Egypt (Jer 43:10) and Judah (2 Kings 24-25) and consequently Nebuchadnezzar was greatly blessed by the presence of a number of devout men who were forced into his service. One of these men was Daniel the prophet, who was captured as a youth and transported from Jerusalem to Babylon. Daniel served as a counsellor, wise man, and administrator to the king. God allowed Nebuchadnezzar to prosper, but at his zenith God showed him he was simply a man, when He reduced him to living like an animal for seven years (Dan 4). 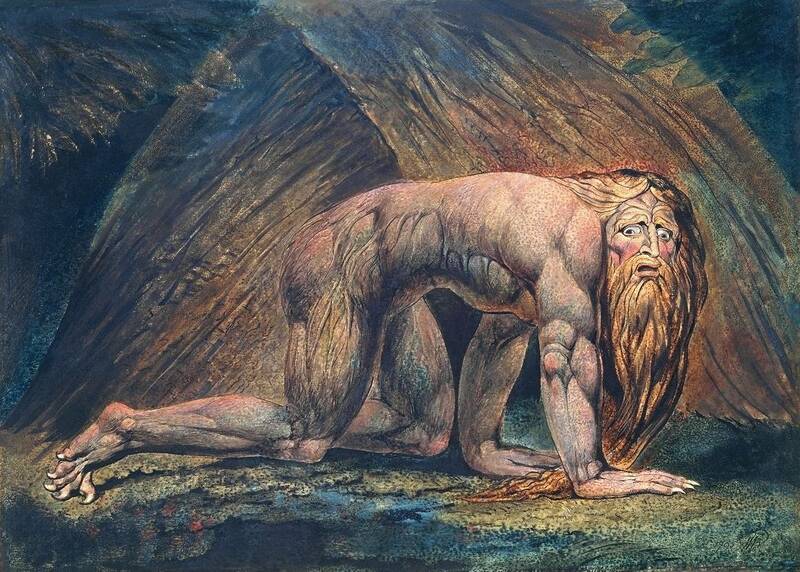 Eventually, Nebuchadnezzar recognised that the God of the Jews is the sovereign God of all creation, who is worthy of honour and praise (Dan 4:34-37). 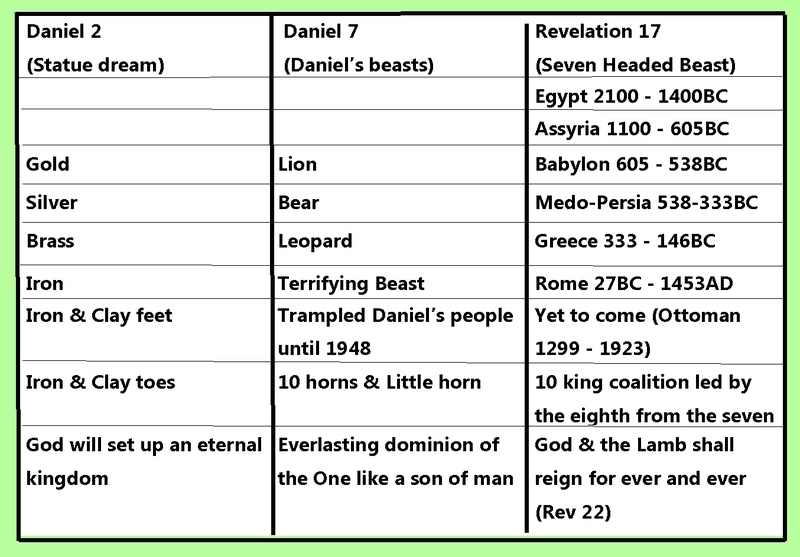 Jesus referred to Daniel when discussing the end-times with His disciples (Mat 24:15; Mk 13:14) and, as mentioned in an earlier post, the prophecies found in the Book of Daniel are the key to end-times prophecies. Daniel specifically told the king that his dream was relevant to the “latter days” or the end-times. Daniel then went on to recount and explain Nebuchadnezzar’s dream, which concerned an image of a statue made from a range of different metals and clay. Daniel’s later dream was about four huge, unnatural, terrifying beasts. The pagan king saw the future as a magnificent statue of a man with a head of gold, while the prophet of God saw terrifying, wild beasts, similar to the beasts the apostle John saw much later and wrote about in the Revelation. The godless man saw only human achievements, the godly men saw what lay behind those achievements. Daniel explained that the first kingdom was Babylon, and Nebuchadnezzar was the golden head of the statue (Dan 2:38). This kingdom corresponded to Daniel’s lion. The next part of the statue was made of silver, this represented the Medo-Persian Empire and corresponded with Daniel’s bear (Dan 5:26-31). The belly and thighs of the statue were made of brass, this represented Greece and corresponded with Daniel’s leopard (Dan 8:20-21; 10:20-11:14). The fourth empire was represented by iron legs and corresponded with Daniel’s last terrible beast, which represented the Roman Empire. As noted earlier the seven heads of the beast in the Revelation represent seven consecutive empires (Rev 17:9-10). 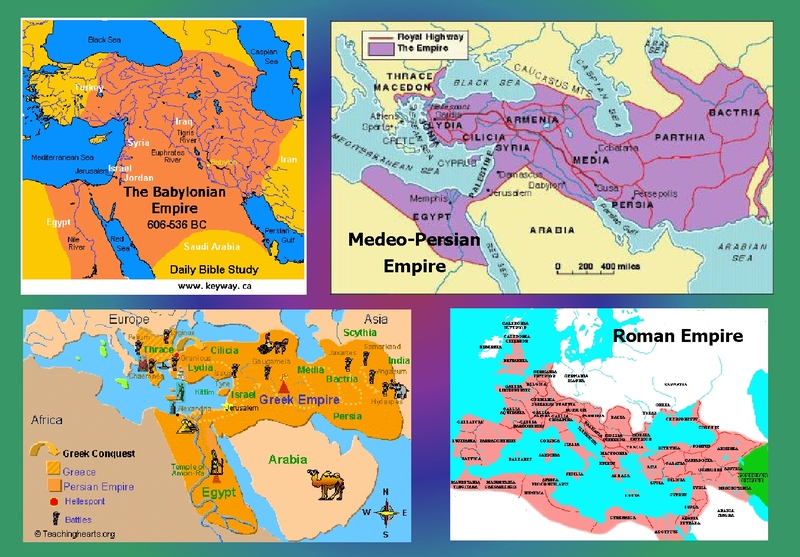 When Nebuchadnezzar had his dream two of these empires had already fallen, thus Nebuchadnezzar’s dream only referred to the empires that would follow his own – Babylon, Medo-Persia, Greece and Rome. This accounts for six of the seven heads on John’s beast and we know that the seventh kingdom had “not yet come” when John recorded his vision. Nebuchadnezzar’s dream also gives us another reason to safely assume the hills/mountains upon which the whore is seated in John’s vision (Rev 17:9) are in fact kingdoms. At the end of his dream Nebuchadnezzar saw a great mountain fill the earth (Dan 2:35). Daniel explained that this great mountain was God’s kingdom “that will never be destroyed” (Dan 2:44-45). It was also noted earlier that some people believe the leopard-like beast of Revelation 13 is a different beast to the scarlet beast in Revelation 17. 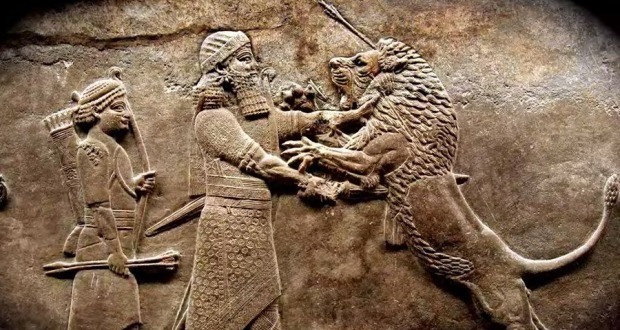 However, it seems more likely that the leopard-like beast in the Revelation carries with it a hint of kingdoms past from Daniel’s dream (Daniel 7:1-8). These beast kingdoms reveal the true power behind the pagan kingdoms of this world. 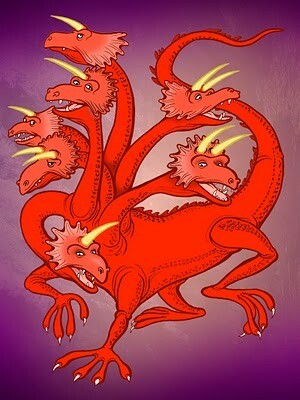 In Revelation 12 we are introduced to the dragon, which also has seven heads and ten horns. It is “the ancient serpent, called the devil and satan, who deceives the whole world” (Rev 12:9). One could speculate that the seven heads of the dragon represent the seven powerful, godless kingdoms God will allow to overrun his “glorious land” (Dan 11:41). We have already discovered the dragon will give its power and authority to the leopard-like beast (Rev 13:2); the dragon is the true head of each of these kingdoms and it will be the power behind Babylon the Great – the last powerful, godless kingdom of this world. The leopard-like beast has aspects of a lion (Babylon), a bear (Medo-Persia) and a leopard (Greece) when it first appears in John’s vision (Rev 13). When it morphs into the scarlet beast (Rev 17) it will enter its final phase; it will be about to take part in satan’s last ditch attempt to deceive the peoples of the world. We now know that its seven heads represent seven kingdoms, one of which was yet to come in John’s time. The kingdom that had “not yet come” would follow Rome (Rev 17:10). When John recorded the Revelation, Rome had achieved world power similar to that of ancient Babylon at its height. Rome was a city that had become an empire, just like Babylon; and like Babylon she was a brutal, ruthless power that swept all before her. When Babylon and Rome were both “great cities”, they nurtured many false religions and many false gods within their domains and behind their power it is reasonable to assume there were principalities and powers that were at work in the spiritual realm. These kingdoms and the kings that ruled them stood against God’s rightful reign and rule on the earth He had designed and created, and from the Bible we learn that powerful pagan nations have powerful supernatural allies (Daniel 10). An angel of the Lord told Daniel about a battle between the angel Michael and the Princes of Persia (Daniel 10:13, 20) and Greece (Dan 10:20). 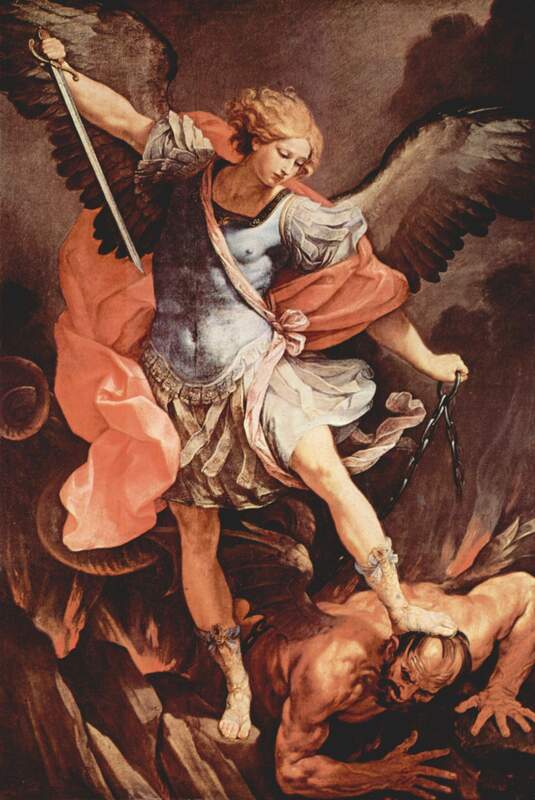 Michael is the archangel (Jude 1:9), who watches over Israel (Dan 10:21) and contends with the devil (Jude 1:9), battling with him in heaven (Rev 12:7). Most commentators understand Michael’s princely foes to be fallen angels, who were serving satan’s cause in the pagan nations whose names they bore. We know very little about the angelic realm, but this glimpse into these powerful beings gives us some understanding of the influence fallen angels wield over the nations of the world. From history we learn that both Greece and Rome were divided, just like the thighs and legs of the statue in Nebuchadnezzar’s dream. In 330 AD, the Emperor Constantine split the Roman Empire into two parts. The Western Empire spoke Latin and was centred in Rome, while the Eastern Empire predominately spoke Greek and was centred in Constantinople. Over time, the Eastern Empire thrived, but the west gradually declined. The western part of the Roman Empire fell in 476 AD, when Romulus, the last of the Roman emperors in the west, was overthrown by the Germanic leader Odoacer. 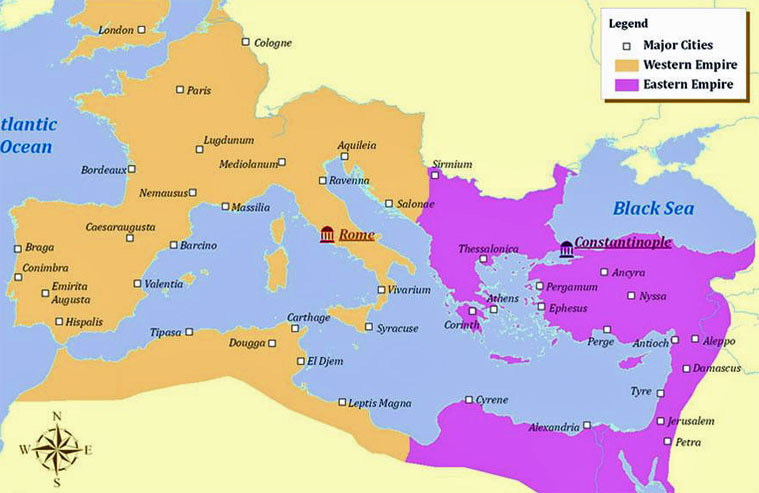 However, the eastern half of the empire continued to exist as the Byzantine Empire for almost a thousand years. The Roman Empire was never actually conquered, to be more accurate, it gradually disintegrated. In the west an attempt at revival was made in the form of the Holy Roman Empire, which existed between 962 and 1806, but this empire never again reached the heights of the Roman Empire, and it never encompassed Israel. The statue in Nebuchadnezzar’s dream also had feet and toes made from a mixture of iron and clay (Dan 2:33), which could be considered another empire, but this is more difficult to determine and opinions differ on what the feet and toes might represent. While many claim they were simply a continuation of the Roman Empire in its declining stages, others believe that the iron and clay empire corresponds with the seventh kingdom mentioned in Revelation 17:10, the empire that had “not yet come” in John’s time. All of the empires represented in Nebuchadnezzar’s and Daniel’s dreams came out of Babylon – out of Nimrod’s original rebellious kingdom – and at some stage they all controlled Jerusalem. Daniel told Nebuchadnezzar that the God of heaven had given him his kingdom and he was the golden head of the great statue image (Dan 2:38). History tells us that the subsequent empires flowed from his kingdom. One conqueror after another enlarged and controlled the area that is now known as the Middle East, but from God’s perspective, Jerusalem was the centre of this area, not Babylon or Rome. In Nebuchadnezzar’s dream, God’s eye was on His Holy Land. During the 16th and 17th centuries, in particular at the height of its power under the reign of Suleiman the Magnificent, the Ottoman Empire was a powerful multinational, multilingual empire controlling much of Southeast Europe, Western Asia, the Caucasus, North Africa, and the Horn of Africa. Before the Ottomans took the reins of Nebuchadnezzar’s feet empire, a new element had been introduced into the existing geopolitical landscape. A new, false, monotheistic religion gradually took hold of the whole area. This religion could be seen as the clay that weakened the iron. Humans came from clay (Gen 2:7) and the human alternative to God’s Way might well be depicted as clay. The Ottoman Empire had some of the strength of the past empires but the new false religion – Islam – had been introduced into the mix. Although religion can unite people, the never-ending conflict between Sunni and Shiite factions means that Islam has a strong, foundational schism, an inherent weakness. It is almost impossible to imagine a stronger but more brittle empire. Conflicts arise almost everywhere this religion takes a hold, shattering communities and nations. Thus, while the Western Empire was overrun by the pagan pseudo-Christian religion – Roman Catholicism, in the Eastern Empire Islam began to grow and conquer the nations and tribes of people who came under the dominion of the expanding Muslim Empire. The Muslim conquests were rapid and far-reaching, and by 750AD Islamic monarchs controlled kingdoms stretching from central Asia to Spain. 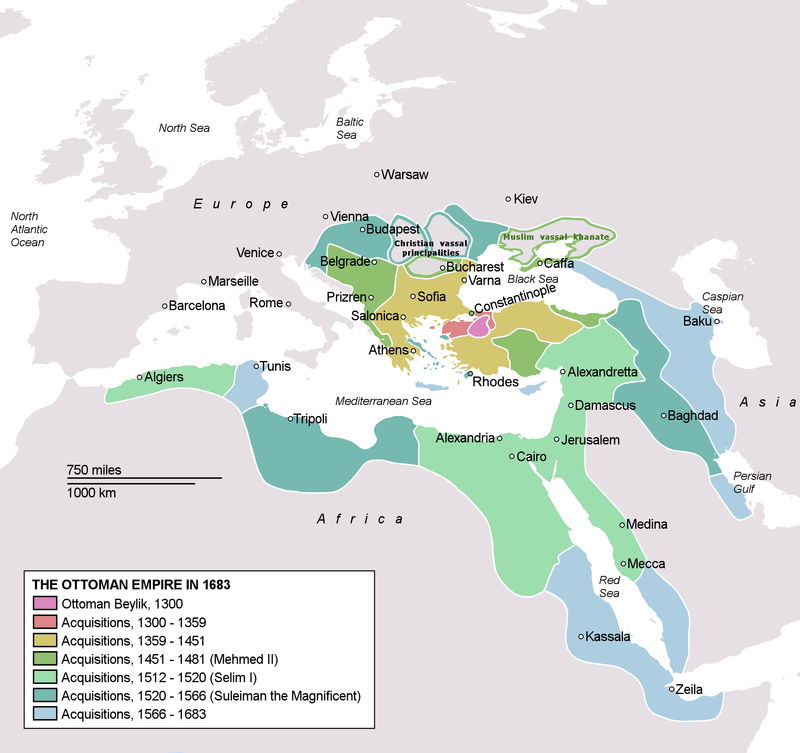 The Muslim Empire grew to surround the declining Byzantine Empire on its eastern, western and southern boundaries. Many claim the first major Muslim conquests were renowned for their brutality. This is a difficult claim to substantiate as there is little documentation from the time. Nevertheless, brutality has been the hallmark of numerous Muslim sects up to and including the present day and there is no dispute over the fact that Muhammad sanctioned the beheading of prisoners of war and engaged in many battles, setting the stage for ongoing conflict. Immediately after his death in 632, Muhammad’s successor, the first caliph Abu Bakr, proclaimed a jihad against apostate Arabs. Many of these people had only nominally accepted Muhammad’s teachings during his lifetime, but following Muhammad’s death, these doubters expressed a desire to abandon Islam. The “faithful” labelled such people “apostates” and the battles that ensued became known in Arabic as the Ridda or Apostasy Wars. It is claimed that during these conflicts tens of thousands of Arabs were put to the sword unless they re-submitted to Islam. This is certainly an effective way to build a new pagan religion. Abu Bakr al-Baghdadi is the leader of the Islamic State of Iraq and Syria (ISIS), an Islamic extremist group in western Iraq, Libya, northeast Nigeria and Syria self-styled as the “Islamic State”. It is believed that he has been proclaimed by his followers to be a Caliph. 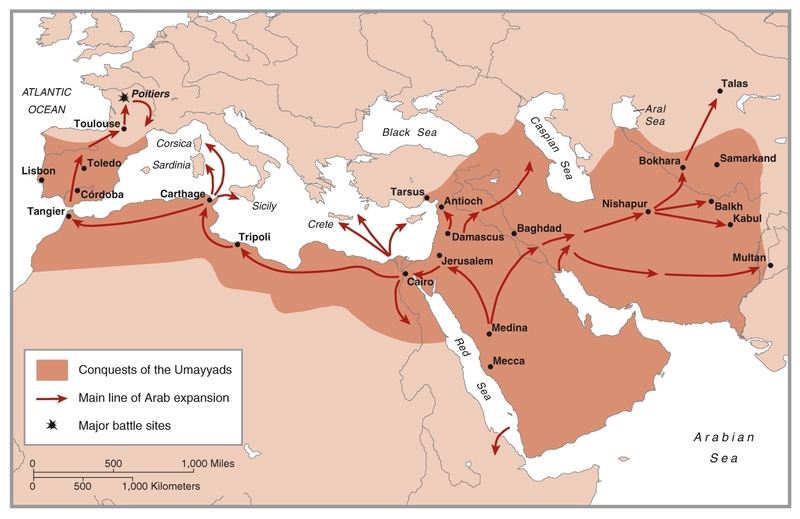 After The Ridda Wars ended around 634AD, the next caliph, Omar, launched the Muslim conquests. Syria was conquered around 636, Egypt in 641 and Mesopotamia and the Persian Empire in 650. By the early 8th century all of northern Africa, Spain to the west, and the lands of central Asia and India to the east, were also brought under Islamic rule. Both Catholicism and Islam have distorted God’s Word. Catholicism has introduced goddess/Mary worship and other nonbiblical practices, but Islam has gone much further, Islam has superseded Jesus – the Son of God – with Mohammad. From a Christian perspective Islam is, by definition, blasphemous. Muhammad plagiarised the Bible, taking from God’s Word many teachings, which he incorporated into his new pagan religion. If Christianity sanctioned the oxymoron “Holy War”, it would be hell bent on destroying every Muslim for their disrespect of the Holy Bible and their appalling irreverence towards the Lord Jesus Christ, when they proclaim Him to be no more than a prophet. But true followers of Jesus know that violence has never been part of Jesus’ teachings; they know that God is love (1 John 4:8, 16), and ultimately His love will conquer all, not the violence that is endemic to satan’s cohorts. 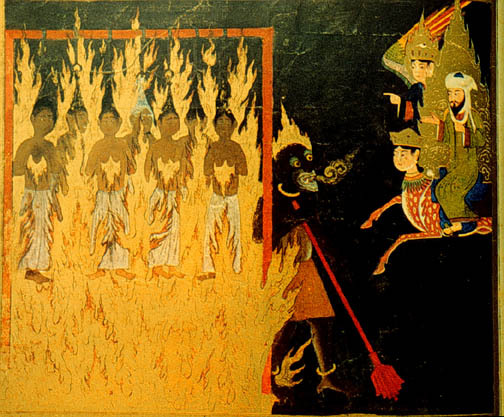 Catholicism and Islam also appear to agree on a fundamental evil doctrine – the eternal torment of souls in hell. This belief can be traced to pagan religions and probably came from Babylon through Zoroastrianism to Catholicism and Islam. The Western Roman Empire would have nurtured the idea in Greek and Roman beliefs about the underworld, while the Eastern Empire would have added satan’s original lie – that we “will not die” (Gen 3:4). Belief in immortal souls is a fundamental teaching in Hinduism and it could well have come to the Eastern Empire through contact with this religion. Gradually these ideas spread throughout the whole region, influencing even intertestamental Jewish writers. Perhaps such pagan ideas blinded many of Jesus’ Jewish contemporaries to His deity. The Bible teaches an entirely different eternal destiny for those who refuse God’s gift of eternal life through His Son. Jesus clearly declared they will perish (John 3:16). A closer examination of the Bible reveals that the doctrine of eternal torment hangs on a particular interpretation of the parable of the rich man and Lazarus and one verse in Matthew. The ideas of human immortality and eternal torment were probably introduced into the Christian community in the second century by converted Greek philosophers like Tertullian, whose pagan backgrounds were influenced by the doctrines of Plato and Socrates, both believers in human immortality. Sadly, the Protestant churches have also taken these evil, nonbiblical beliefs on board, but there are many Bereans who have examined the scriptures for themselves and rejected these pagan teachings. May our dear Father continue to open the eyes of His people to this deception from Babylon. 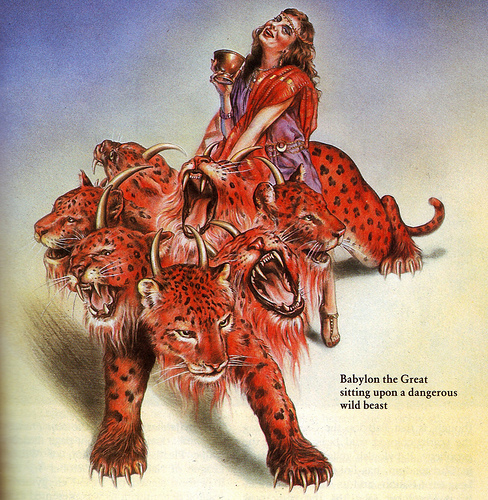 John’s vision of Babylon the Great portrays the whore, which represents false religion, riding on the beast, which represents the last great pagan world empire to conquer Israel. The Hebrew word for seven means sufficiency or fullness. God allowed seven pagan kingdoms, which were dominated by false religion to overrun His beautiful land. The last of these seven kingdoms came to an end in 1920, and miraculously, the State of Israel was “born in one day” (Is 66:8) in May 1948. The Jewish people are now back in the land of Israel. 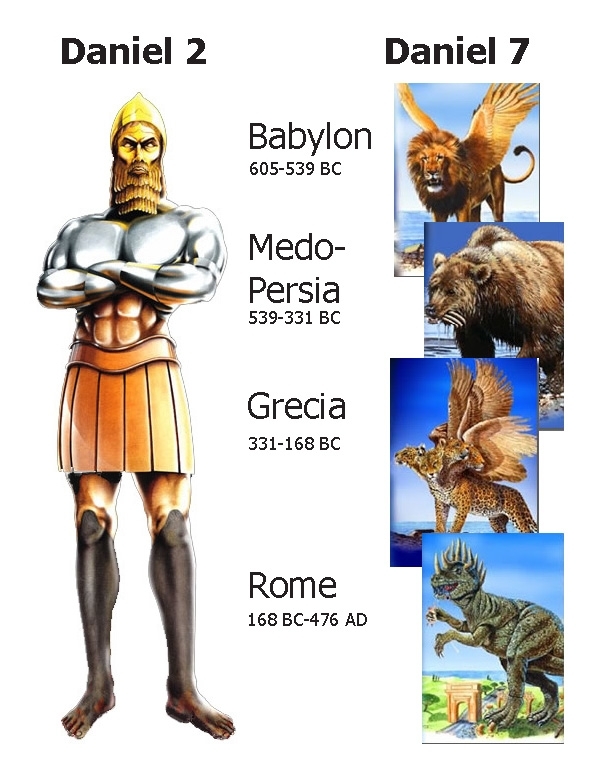 However, the world is currently poised for the eighth pagan empire, the toes of Nebuchadnezzar’s dream statue (Dan 2:42-43), which we learn from the Revelation will come “out of the seven” (Rev 17:11). This will be the final pagan world empire God will allow before he brings this present fallen world to its end and His new eternal kingdom comes into being (Dan 2:44; Dan 7:27; Rev 21:1). God Himself will crush this final kingdom of satanic defiance. The mystery of Babylon the Great is partly revealed. In the time of the Great Tribulation that Jesus mentioned (Mat 24:21) and John warned about (Rev 2:22; 7:14) and outlined in his Revelation, there will be a great worldwide, government sanctioned religion, which pulls together many of the false religions of the world into one great ecumenical religious institution. This new religion will replace true, biblical Christianity after the Rapture and will be supernaturally united with a one world government that comes out of the last of the seven kingdoms. This last empire will overrun Israel yet again, but it will be short lived, because Nebuchadnezzar’s and Daniel’s dreams and John’s vision all clearly announce the coming of God’s eternal kingdom not long after the toe kingdom comes into being (Dan 2:44; Dan 7:13-14; Rev 22:5). Each of the seven great pagan empires had great leaders who were satan’s emissaries in their time. The beast of the Revelation, will be satan’s emissary and he will be none other than the Antichrist John refers to in his letters (1 John 2:18,22; 4:3; 2 John 1:7). This man is also mentioned in the Book of Daniel, but we will look at him in greater detail in the next and last post of this series. (1) Hislop, Alexander (2010-05-14). The Two Babylons or The Papal Worship Proved to be the Worship of Nimrod and his Wife (p. 1). . Kindle Edition. (2) Josephus, Flavius (2014-07-23). Flavius Josephus: The Complete Works of Flavius Josephus (Kindle Location 709) Kindle Edition.